It was a long time coming. First the book, then through part 1—we’ve had years to say goodbye to Harry Potter. And yet, I wasn’t ready. Walking into the theater, I got really sad. I was eighteen and a college freshman when I started my time at Hogwarts. I’m twenty-eight and an adult now. I shouldn’t be maudlin over a young adult series, yet I am. I generally don’t have a hard time leaving behind the places a good book creates inside oneself, but I never wanted to leave Hogwarts. Of all the literary worlds I’ve read about or imagined, the only one I would actually want to live in is the world of Harry Potter. Please. Like we all wouldn’t want to be there. So yes, I was choked up going into the theater and only half-ready to say goodbye. I loved the movie because I am a fan of Harry Potter and I don’t really care if the thing was just sequenced shots of peep dioramas—I was going to love Deathly Hallows part 2 no matter what. And there was a lot of greatness in it. Alan Rickman threw down as Snape; the execution of his death scene was handled brilliantly. I loved the addition of the boathouse on Hogwarts’ lake, I love that even in the final film the producers and crew behind the HP franchise continued to add to and build in the world. The boathouse allowed showing Snape’s death without actually showing it. The look on Harry’s face as he witnessed Nagini attacking Snape through the window is heartbreaking. And oh god. The look on Snape’s face when he holds Lily Potter after she’s died. His raw anguish, his very real suffering and palpable love juxtaposed against the totally heedless way he storms over James Potter’s body on the stairs and his total lack of interest in the crying baby. That captures Snape’s love perfectly. It’s a total, all-encompassing love, sure, but it’s a selfish love, too. Alan Rickman was stellar. There are murmurings of a possible Oscar campaign for him. I’m not sure he was physically in the movie enough to really convince the Academy to nominate him, but what he accomplished in his brief scenes was the best acting in the entire franchise. My other favorite acting moment was in the very beginning when Voldemort realizes Harry and his friends are destroying horcruxes. The look of pure terror in his eyes is why you shell out the money for a guy like Ralph Fiennes. Buried under makeup and CGI, Fiennes still communicates with only one look the fear and the madness that are overtaking Voldemort. Watch that again and tell me it isn’t a brilliant piece of acting. Everyone else acquits themselves nicely. The Holy Trinity of Daniel Radcliffe, Emma Watson and Rupert Grint developed into decent enough actors. They each show glimpses of abilities beyond decent but generally they stick to the basics with their characterizations. I’m not complaining. They get the job done and they do it well. Just not like, Rickman/Fiennes well. The standout for me was Alexandre Desplat’s (The King’s Speech) score. For both parts of Deathly Hallows the filmmakers brought in some new blood with Desplat, who is currently my favorite working movie composer. His score is haunting and stirring and serves the much, much darker tone of Deathly Hallows part 2 very well. 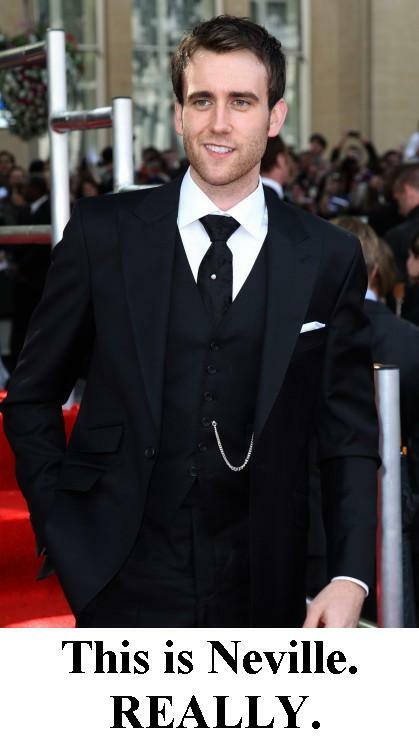 Another standout is Matthew Lewis, who shocked the internet last week by showing up at the London premiere looking nine kinds of hot. Neville Longbottom got a few key scenes and he carried them off well, injecting some needed humor into the movie, but also providing a foil for Harry. I got the feeling in the book that, in Harry’s absence their last year, Neville really emerged as a leader at Hogwarts. I’m glad that the movie preserved that. Also, Lewis is super hot. Did I mention that? As for the technical stuff at which Harry Potter usually excels—it’s all there. The VFX are great, costuming was wonderful (I want to be McGonagall for Halloween), and if the direction suffered a bit for choppy editing, it’s easily overlooked thanks to an assured tone and pace. I know some people have bitched about the pace but have you read the book? From the break in at Gringott’s on it’s a downhill run. The movie kept a similar pace. So yeah, I really loved Deathly Hallows part 2. Except for a minor logic gap and an epic motherfucking continuity fail. First, the logic gap. Cho Chang is in the hideout Neville has created in the Room of Requirement and she’s wearing school robes. If I remember right, Cho does show up at the Battle of Hogwarts (along with Wood? ), but she’s a year older than Harry so she shouldn’t be wearing school robes at this point. Not a huge deal, but I definitely noticed and raised an eyebrow. What was a much, much bigger deal—it elicited a horrified gasp from the 200+ people in my theater—was the young Lily Potter and her big BROWN eyes. The books and the movies have spent over a decade emphasizing how Harry has his mother’s eyes and here is Radcliffe and his baby blues locked in a stare-down with Snape before Harry visits Snape’s memories. Snape’s dying words, “You have your mother’s eyes” are followed by Harry NOT having his mother’s eyes. How do you even mess that up? The ONLY casting requirement for the little girl who would play young Lily Potter is “must have blue eyes”. You can’t show me a close-up of Radcliffe’s blue eyes along with the line, “You have your mother’s eyes” and then cut to a kid who DOES NOT HAVE THE SAME EYES. This is driving me nuts. I simply must stop myself from caring about this but it’s a glaring mark against a franchise that has been so careful and dedicated to every detail over the years. Still, those things aside, I found Deathly Hallows part 2 to be a satisfying, thrilling end to the Harry Potter franchise. I also thought that this movie, more than any other, handled the theme of “those we love never really leave us” the most elegantly. They got through that idea without bashing us over the head with it (although Harry’s scene with the ghosts of his dead loved ones came pretty close to head-bashing), and they used it to show how that can give us courage and inspire. Deathly Hallows part 2 struck all the right notes of action, adventure, friendship, courage and love. I wasn’t ready for the end but now that the end is here, I can embrace it. Thanks for ten good years, Harry. OMG, yes, Lily’s eyes completely bothered me too when watching it!!!! I immediately noticed it too and it’s a shame because it took me outside of the world that I had been so engrossed in watching. Otherwise, LOVED the film – thought it was so well done and have not stop raving about it! How could you not mention Maggie Smith? She was AMAZING! When the first walk into the train station at the very end, was that Jo and David Hayman getting off a train? Maybe I have seen too many Hitchcock movies. Oh my gosh! I didn’t even notice, but I do think there was something about them having a cameo? Now you’ve given me a reason to see it again. The other thing that really pissed me off was that Harry didn’t fix the phoenix wand. How could he not fix the phoenix wand!?!? Is he just going to use that poor stick of the other Malfoy’s? Otherwise, I’m thoroughly pleased with the film. I was a wreck from Snape’s death through the end of the main narrative. I feel there might be a really good argument for buying the ultimate edition of HP7B. We might get one hell of an extended version. Yes! Harry not fixing his faithful phoenix wand bothered me- they bothered to show the importance of the wand breaking, and Hermione being unable to mend it, so to not show that Harry used the elder want to fix his wand was an oversight. That and Lily’s eyes bothered me. I really enjoyed this movie, like you said: a satisfying end to the franchise. But I was very disappointed that it was never really stated that Harry’s invisibility cloak is The Cloak and that the resurrection stone came from the ring horcrux. Because of this I think non-readers will not get that Harry’s survival wasn’t a sudden convenience, it was in the story all along. And you are right, the music was the part that KILLED me. When the heads of the houses (and mrs. Weasley instead of professor Sprout…) cast the protective charm around the school and the music kicked in, I was bawling because it was such a beautiful sight. Truly enchanting moviemaking. 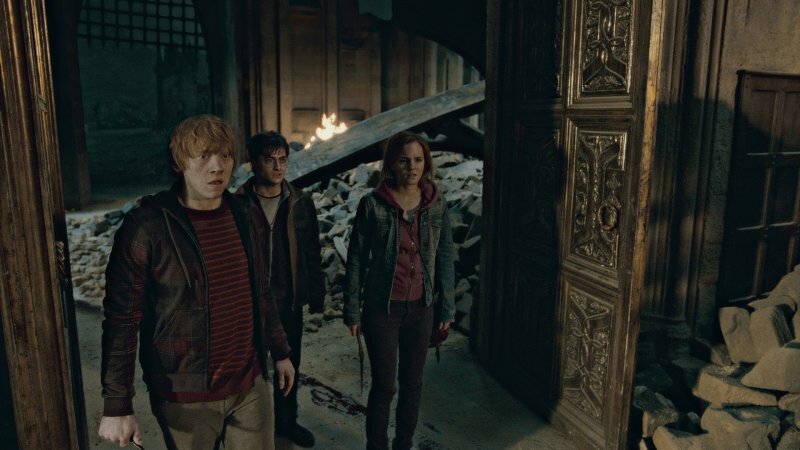 I believe that during the deathly hallows sequence of HP71, hermione and ron look at each other as if to say “hmmm….who do we know that has a cloak of invisibility…” The story itself implied that the cloak was handed father to son, generation after generation, and we know Dumbledore kept the cloak for harry til he was of age so…1+1=2?? Also, I thought the ring Horcrux was explained in Half Blood Prince. And I know the ring was explicitly shown in snape’s memories sequence, several times so…. Yeah, I know Im rather late to the Potter Party, but I just saw it today and I was floored. FLOORED> Not only did the film fully capture the spirit, heart, sacrifice, heartache and love of the last half of the book…it totally blew any visual expectations or imaginings I i’d dare to dream. The Battle of Hogwarts, my mind is blown! For once, this film more than any other the other previous did not murder the story by omissions. 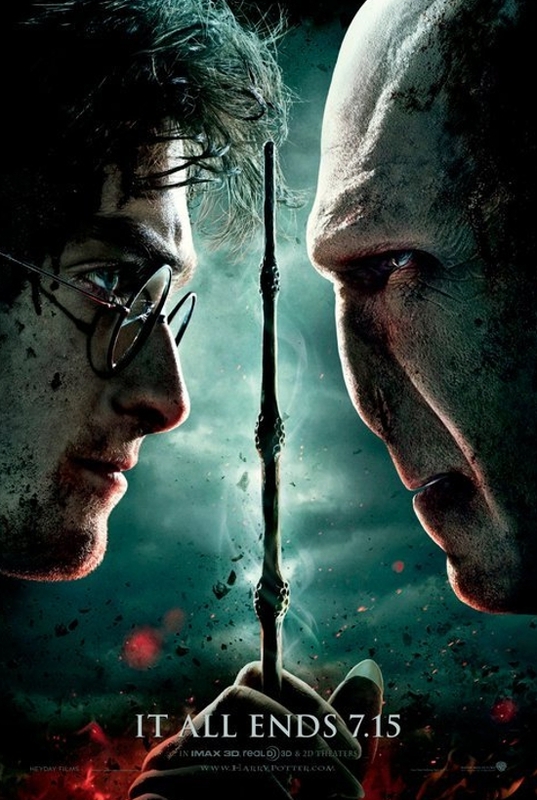 The weakness of every film since Azkaban has been the stripping of the story to the barest plot without any of the details that connect relationships and give insights into characters. The last film that managed to shear the plot while still capturing the tone of its book and at least provide a driving(if somewhat less robust) narrative was Azkaban(which was also my favorite Potter movie till today). Ever since Azkaban, more and more interweaving details were left on the cutting room floor, and the narrative suffered. Moments that shone in the book with proper build up came off flat in the movies. And this process compounded on itself in movies 5 and 6, with 5 being that absolute worst HP movie imo with a barely there plot with little to nothing added to the characters and their interrelationships. Half Blood Prince ameliorated this ( a bit) in the first half of its movie, but then had to rush through MAJOR PLOT POINTS in the second half which made the film rushed and lacking in any suspension or elaboration of story. However, the producers made the best damn decision of their lives when they decided to divy up the last book and give themselves the time to do the damn thing right. I liked very much HP7 part 1. It was slow going in the beginning mainly because it had to pick up the mangled threads of the previous movies. But once its own plot got well underway, I loved the feeling of tension, the feeling of unease and uncertainty that pervaded the story. Bad things are happening. Bad things are happening to good people. Bad things are happening to the innocent, and to children. You got the sense of Harry and his allies struggling against a huge force that really means to do them real harm. People are dying and getting injured, and internal stresses cause the Trio to fracture. The mood and tone of the fill was set marvelously and the film had enough time to really do justice to the plot. The film even had time for a brilliant animation to properly explain the Hallows, which was probably the highlight of the film for me. HP7-1 took the time to set the tone and get the details RIGHT and HP7-2 reaped all the reward of that effort. So, in HP7-2 we jump right into the story with the Trio at Shell Cottage and Harry hatching his next movie after speaking to Ollivander and Griphook…and you can tell by the score in this scenes that the same ominous mood from part 1 is in play. There is still Danger and Bad Things will happen. And its this setting the tone early and getting it right from the beginning which imo sets the film in full flight from the beginning. As far as I was concerned, from that moment on, the film hit every note perfectly. I was fully engaged and laughed when Hermione masquerading as Bellatrix actually said “have a good day” to someone. I was TENSE when they approached the tellers at the Bank. I dismissed the advertisement for the roller coaster at the Universal theme park, but when the dragon was onscreen, I squee’d like a fangirl. The vault scene and escape was just as imagined and by the time that set piece was over, I felt that if the film kept going the way it did, it would be awesome. And then they went and blew my mind…. 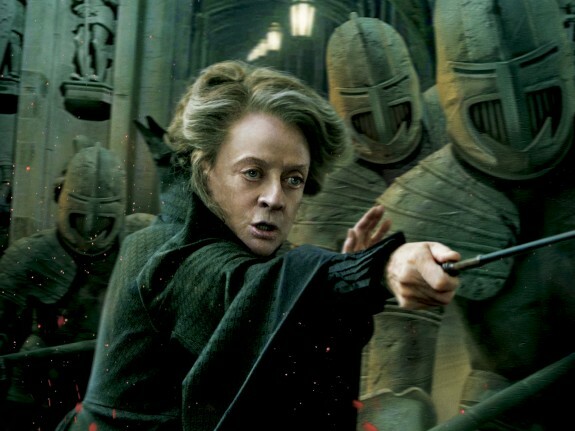 I about cried when McGonagall set loose the stone soldiers. I had forgotten they were in the books, but I have to admit I got emotional. I loved that they stuck to the BadassNeville! from the books, and even augmented his role that not only worked to highlight his character, but it WORKED for the movie as a whole. I liked that it underscored the theme of everyone doing their part to not just defend Hogwarts, but their way of life. It highlighted that ole Gryffindor courage, and there was even a shoutout to book 1 with Seamus’ exploding spells. 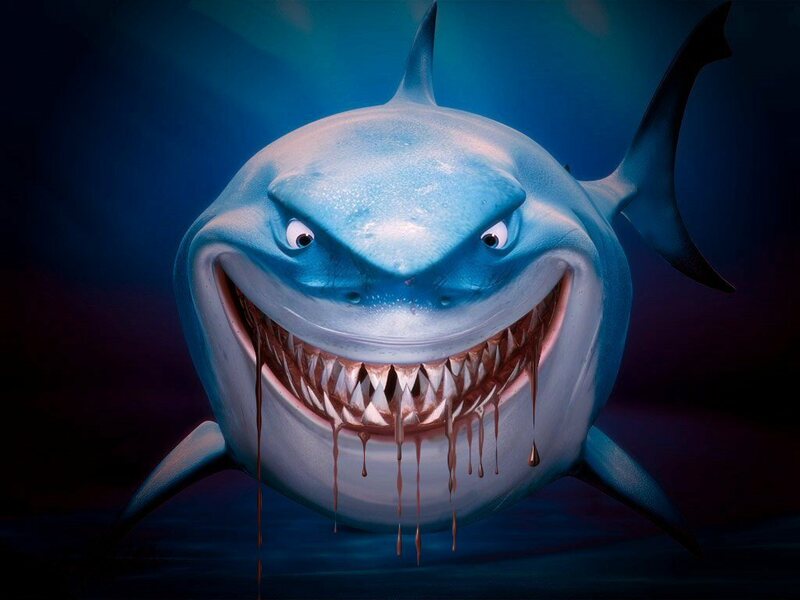 This was a rare instance of the movies deviating from the book…and making the story BETTER. I will say this, I didnt notice the Cho Chang in school robes, or the glossing over of Dumbledore’s Army because for me the plot for HP7 was working for me this was an example of the leftovers from the earlier films’ mangling of the book story. The best move the writers and director could make for coherency of plot imo was to gloss over it and keep it moving, which is what they did. It was enough that the characters who were supposed to be there, were there. The most important thing that the movie got ABSOLUTELY right when it came to the Battle of Hogwarts was* scope*. The size of Voldemort’s Army. The scale of the Castle and all the area to defend when compared to those inside actually defending it. The sheer numbers of the Dementors hovering in the sky. And also, the huge shockwaves and shimmers of magic from spells cast by the more powerful witches and wizards( Im looking at you Aberforth). This was a frakking BATTLE, and the CGI did it beyond justice. 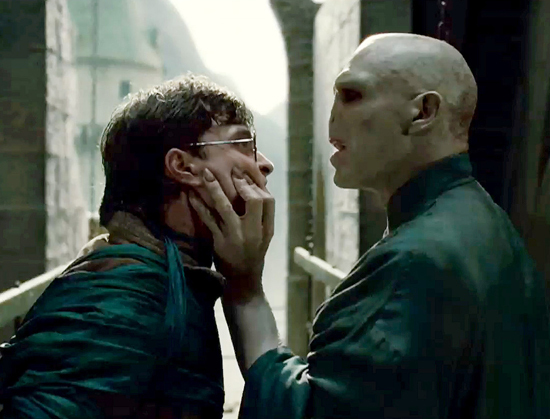 I dare say this is the one Potter movie that if you didnt see it in theaters, you are shortchanging yourself. The Fiendfyre sequence, the Horcrux’ when they are destroyed, the power of Voldermort’s spells, …….the CGI department earned their checks. As far as deviations from the books went, where I noticed them, I thought for the first time, that they made sense and that they worked. For instance, at first I was bothered when Hermione( or whoever it was) stabbed the Diadem instead of in the book where the FiendFyre destroyed it. But then, by doing it that way they dont have to explain why Fiendfyre is a really powerful spell blah blah blah blah. We’d already established that basilisk fangs and magical swords destroy Horcruxes, no need to add more expo. I agree with everything you said about Snape. And I loved the reverence in tone for the scenes leading up to and after Harry’s Death. I liked that they chose to deviate from the book again and expanded the final confrontation, which again imo worked for the film. The best part of the final act is, after its all said and done and the relief, joy, triumph also and sadness for loved ones lost has set in….the film didnt delve into some cheesy Star Wars type celebration….it was just a sober, measured sense of relief. That 7 years of fighting, loved ones dying, fear and heartache were over. Thats real. And it was note perfect. The epilogue was just icing on the cake, Id given the movie 5 stars just for the ending shot alone of the trio staring ahead at an unknown and welcome future. So I was happy, I was said, I laughed, I cried, I pondered, I squee’d. This movie took me there, and I cant imagine that they could have done a better job than they did. HP7-2 was the perfect sendoff( lily evans’ eyes aside…that did bother me as well). Thanks for the memories Harry. Cho Chang WASN’T wearing a school robe when Harry came back to the room of requirement (led through tunnel by Neville). She’s wearing a blue button up sweater. idk what scene you were referring to, but even if she wore one, it wasn’t too big of a deal… if the graduates went back to fight for the war what’s wrong with wearing school robes? Just prove all the students were proud of their school.